We've been in Trondheim now for 5 weeks, and the farthest we've ventured out was Hell (about 40 km away). It's not because we are lazy or unmotivated. It's because we've been going to a lot of local places on the weekends to save a little money. There is actually a ton of outdoors stuff to do around Trondheim, especially in the huge Bymarka park. But for our last two weekends in Norway, we decided to go big before we go home! We rented a car and decided it was time to go visit Cova, my friend who I met a long time ago in Paris. Now she lives in Bergen, Norway with her fiance Vidar (who is Norwegian; Cova is Spanish). Both are engineers, and as most engineers in Norway, they work for the oil industry. Their jobs sound pretty cool, though! The first dramatic fjord we saw out of Trondheim. It was a strange coincidence that we would be in Norway, and Cova lived in Norway. But we couldn't miss our chance to go and visit and it gave us a great excuse to spend a little money and get out of Trondheim! The car rental was pretty cheap for Norwegian standards. The diesel was about $8 a gallon, but our car we rented (a Toyota Urban Cruiser) got well over 50 miles to a gallon of diesel, so it was manageable! On the other hand, Norway's landscape and weather makes it really hard to build roads. 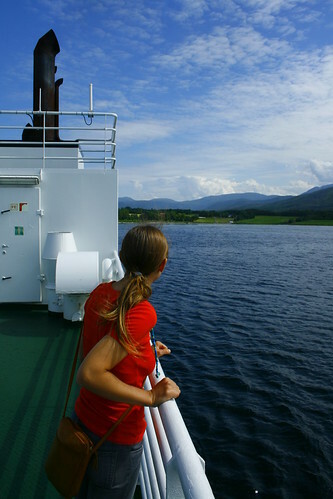 We had to cross a lot of fjords by ferry or underwater tunnel (they were so deep your ears started popping). And some fjords were narrow enough to cross by bridge, but this was rare. Looking out to Kanestraum on the car ferry from Halsa. In Norway, there are a lot of tolls. To have a car in Norway is very expensive, so not too many people drive except if they have money. I am not sure who is responsible for building the roads and tunnels and bridges, but after they are built, the people who build them charge a toll. Most tolls are charged per person plus the car. The same goes for car and people ferries. On our way to Bergen, we took the coastal road, and on the way back we took a more inland route. Along the coast, which is all fjords, there were a lot of tunnels, bridges, and ferries that we had to take. So it was more expensive. 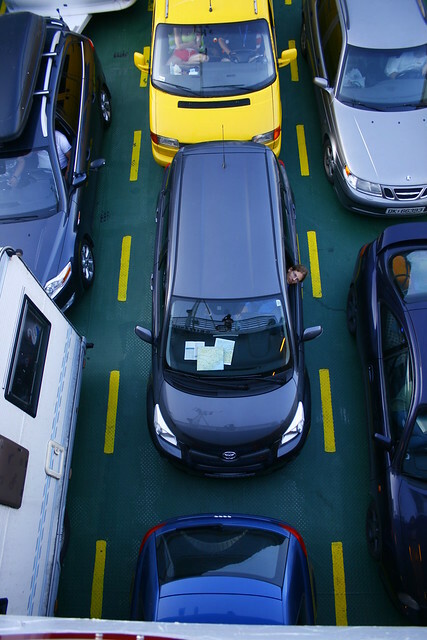 Each ferry on average charged about 120-150 NOK for both of us and the car, which is about $20-$25. Some tunnels and bridges we had to take were just as expensive! Image crossing the Bay Bridge from Oakland to San Francisco and handing the toll attendant a $20 bill, and not getting any change back!!! That's Norway! We stopped for lunch at a picnic area on the Atlantic coast just south of Kristiansund. You might think that the inland route would be a little cheaper because there wouldn't be any bridges or ferries. Only slightly! Over the mountains, if you are not on a main highway, you still pay tolls so they can maintain roads over the big mountain passes. For example, on the way back we had to pay 70 NOK to go over one mountain pass! That's a little over $10. But I'll stop complaining now because in reality, I think every penny we spent was well worth it. The scenery along the way to Bergen was amazing and I was in awe for every kilometer! 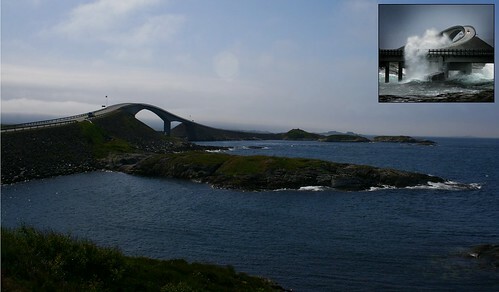 We drove the 8km famous Atlantic Road, but saw it on a calm day with nice weather. The inset shows what it can be like during crazy weather! We started off at about 9am from Trondheim. That was the earliest we could pick up the car from SIXT, the rental company. We were into taking the smaller roads (not the highways), but our map wasn't too detailed to show many of the smaller roads, so sometimes it was a mystery where we were. Out of Trondheim, we headed towards the coast. It was a really nice sunny day so the weather was perfect for driving along the ocean. One of the first things we saw was a loop road that went towards Kristiansund. It was a nice city on the Atlantic. We drove south from there and ended up driving along a really cool road which had a bunch of mini bridges over really small rock islands. We were hopping from island to island, and then we got to a much larger bridge. It looked strangely familiar. We stopped before the bridge where there was a parking area and an information sign. Driving on a typical Norwegian road. Excellent scenery everywhere! To our surprise, when we read the sign, it said that we were driving the famous Atlantic Road! Romy really wanted to drive it and now we unintentionally found it. The bridge looked really familiar because I've seen it on internet pictures (I put the famous internet picture as an inset to our picture). In really bad weather, the waves can get really high! But we were there during good times, so the ocean was very calm and it was pretty warm. Another interesting thing is that the bridge is curved. I don't really know the purpose of that, but it looks cool! 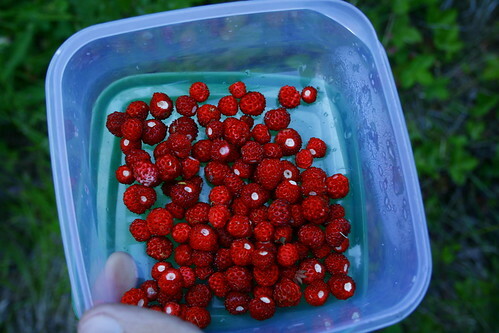 We picked some wild strawberries next to the road and had it in our breakfast the next day. 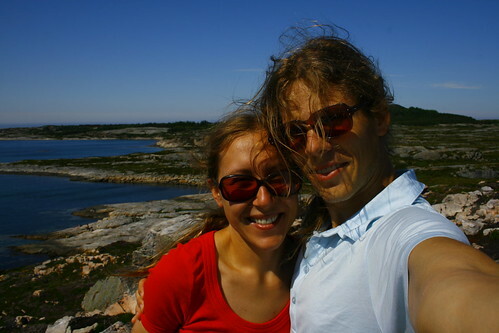 After the Atlantic road, which was technically only an 8km stretch, we returned back inland. When we got to Halsa, we took our first ferry of the day! It was a short 15 minute boat trip to the other side of the fjord. 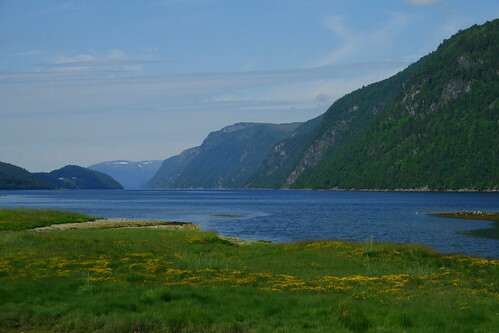 Then we continued on, driving through more mountains and fjords. Eventually we got to Molde, where we took the second ferry of the day. This ferry was crossing more open water, so it took about 40 minutes total. We got to the ferry with about 15 minutes to spare before boarding, and it was getting hot outside, so we indulged in some vanilla soft serve ice cream covered in chocolate! Of course we both got the large size, which in retrospect was way too much but whatever! It was soooo good! Along the way, we drove up the Trollstigen and went to the observation point. On the other side of the fjord from Molde, we saw a bunch of huge jagged mountains still covered with snow. We were about to drive through them in the next part of our trip. 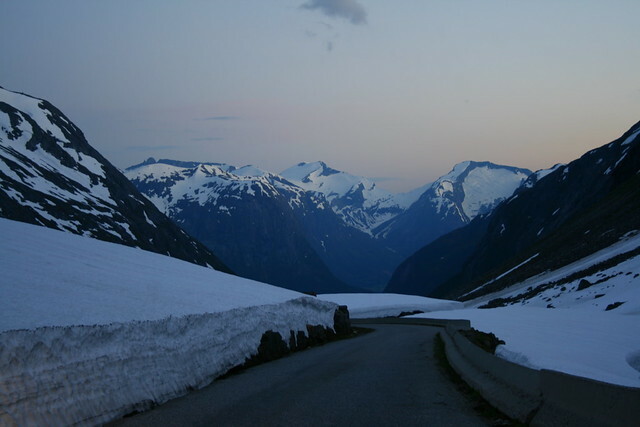 Not too far away, somewhere in those mountains, was a road called the Trollstigen. That's where we were headed. 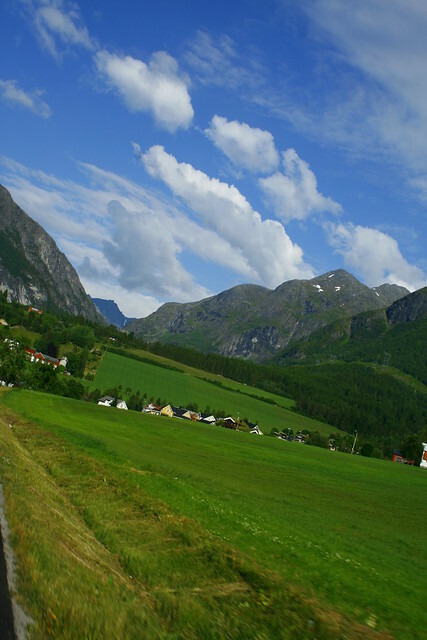 It is a famous Norwegian road which zig zags up a steep glacially cut mountain valley. Along the road are some waterfalls, and great views! When we got to the foot of the road, it was crazy to realize the scale of the climb! We got to the top, very slowly, where there were some newly built observation decks. The decks had glass walls and railings, so you can see just how high you were! The floor of the observation decks were slotted so you can see down through them. Anyone who is even mildly afraid of heights would probably get sick and panicked. There was nothing except a good 1000 ft drop below, and I felt like I had to clutch the railing to feel safe. Don't drop your camera! It would probably get destroyed and it would be irretrievable! 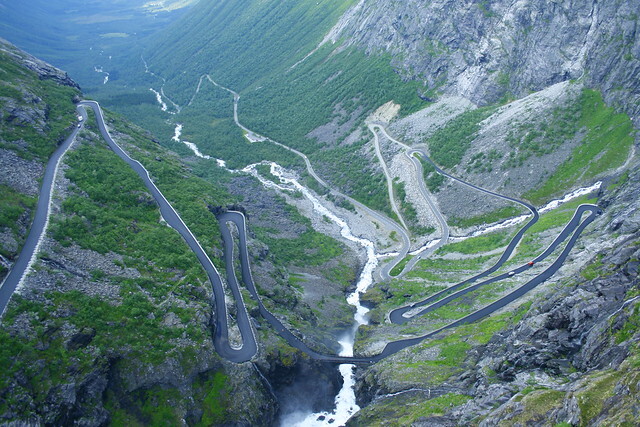 This is the Trollstigen, a crazy road that winds up the glacially carved mountain valley! The observation points were really nice and since it was nearing the end of the evening (it was about 8pm), there weren't many tourists out there. That was really great because the huge tourist buses can get crazy on the road, which is barely one and a half lanes wide, with a death drop or rock wall to each side. A big clear and cold river made a huge waterfall just next to one of the observation decks. We spent almost an hour there, before moving on. We kept driving south, and we needed to catch one more ferry before the day was over so we could see the Geiranger fjord. Aboard yet another car ferry in our rental car! They really pack you in! We ended up getting to the ferry a few minutes late! We were so upset, since at this time of night (by the time we got there it was about 10pm) they only run once an hour. But as we pulled into the ferry terminal, we didn't see a ferry at the dock, and there were still a bunch of cars waiting in line! Could it really be, a Norwegian ferry that was late!? They are usually so prompt! We were so lucky that the ferry was late. As we pulled into the 4th lane (which meant we would be one of the last cars onto the ferry), we gave each other a high five and waited happily until the ferry came into the docks and unloaded all the passengers traveling the opposite way. Once we got on board, we were pretty crammed in, so that they could fit as many cars as they could. 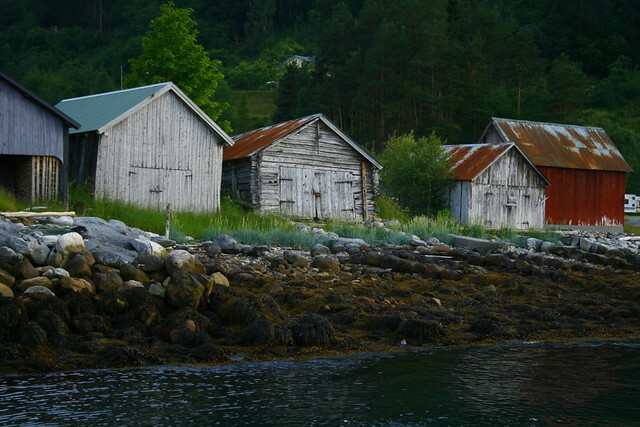 Old fishing huts along the shore of the fjord in Eigsdal. The ferry unloaded us in Eisdal. From there it was a really short drive to see the Geiranger fjord. It was absolutely so spectacular! The fjord was so narrow and steep! There were a bunch of waterfalls flowing over the walls of the fjord and the sky was turning all kinds of colors of sunset. It was about 11pm. We pulled over at a parking area off the side of the road where they had an informational sign. From there we saw a trail that lead somewhere. We wanted to check it out to see if maybe we could get a better view. 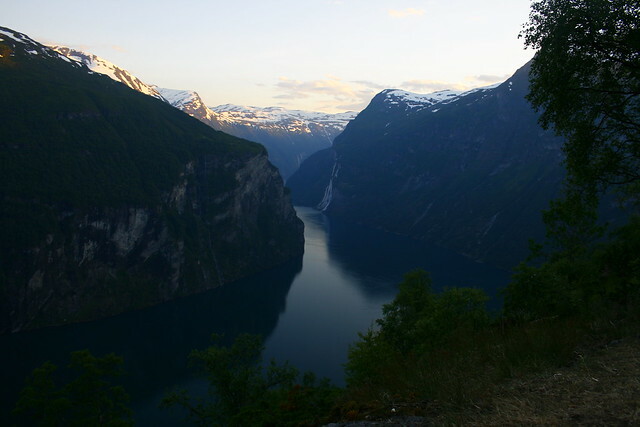 Sure enough, the trail took us along a flat section perched along the steep fjord wall. It went towards the Seven Sisters waterfall, but we didn't go all the way there. We stopped after about 10 minutes in front of another huge waterfall! We had such an amazing view of the fjord from that place! We were kind of scared at some points because the trail went past places that were very much at the edge of a death drop. At one point, I was holding on to a small tree to feel a little more comfortable about standing at the edge while taking a picture. There were some camping spots along the trail, which we were considering camping at. However, I think I would want to rope myself onto a tree in case I would roll in the night. 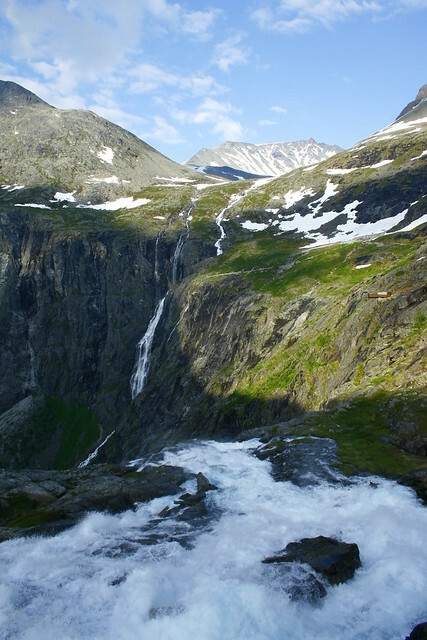 From some of those camp spots, you could literally roll off the mountain and plunge into the fjord below. I am not exaggerating here at all!!!! My favorite spot of the day: the Geiranger fjord! The Geiranger fjord was my favorite thing that we saw that day so far! But in order to make it to Bergen at a decent time the next day, we needed to keep driving so we couldn't camp at Geiranger. Even though it was past 11pm when we started driving out again, we still had plenty of light and energy in us to keep going. The road dropped down into the actual town of Geiranger, and then climbed back up again over another mountain pass to get out. We found a scenic route called Strynefjellet that wasn't too much of a detour after that, which we decided to take. It went up even higher into the surrounding mountains. So high in fact that there was still a lot of snow everywhere. In some places, the snow on each side of the road was taller than the car and we were in a channel of snow! It was really nice, but we decided not to camp here either because we had summer sleeping bags. Eventually the road starting going down again, back to sea level. We found a good pull-off area and got camp set up. Except we were so lazy and tired by that point to set up the tent (it was almost 2am) that we just pushed the back seats down in the rental and slept inside of the car. It wasn't too bad! The next morning, we continued our journey to Bergen. . .
Driving over the mountains at Strynefjellet, which still had deep snow in July! Wow! Enjoyed reading this blog. I'm going to Norway very soon....would you recommend driving the coastal from trondheim to bergen in one day, or is that too much? I don't want to miss the coastal road, but need to do the trip in one day. (We are traveling to see where my Grandfather was from which is way up North). Thanks for this blog!! The coastal road is awesome, so I would recommend it, but one day will be too short, unless you never stop and can make all the ferries on time without too much of a wait (some of them run only once per hour). You can try it, but it will be jam packed with driving. Have fun!